I bought this non-working Centipede from a friend of mine in Decatur. As you can see it has a lot of mileage on it. If the coin counters can be believed (which they usually can't), it has something like 150,000 plays on it, and has been in service on a route as recently as 2005. Atari built these to last, the monitor was the only non-working component. 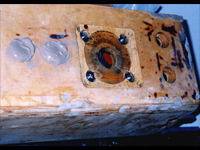 The control panel overlay is worn through, metal rusted and the trackball would barely move from all the gunk stuck inside it. The sideart was torn, faded and scuffed. There was some wood chunks missing in various places and the coin door was bent and missing some trim parts. Fortunately the glass bezel and marquee were both in really good shape. 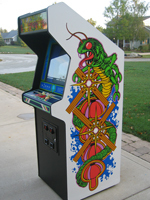 This is great to see on a Centipede, since modern reproductions of these are expensive and of generally lower quality than the originals. After testing and removing the electronics, I stripped off the old sideart. 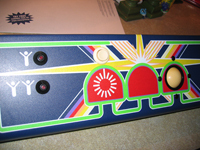 While Atari screenprinted these, they were printed on decals that were applied to the cabinets later. Even after 27 years these still peel off pretty easily. A quick coat of stripper gets it close enough to bare wood for a new primer coat before the new sideart goes on. The new sideart was from Phoenix Arcade. It's screenprinted from the original Atari factory films, and it's gorgeous. Restoring the elaborate sideart on the early Atari games is very satisfying. I unrolled the sideart, peeled the backing off, working down the side. Finally I trimmed the edges with an exacto knife, leaving a half-inch or so over each edge to fold under the t-molding later. After doing both sides I stood the game back up and started on the control panel. Stripping the control panel on one of these classics isn't much fun. 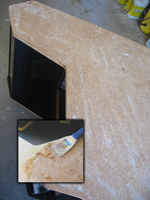 First I used a utility knife to slice the old control panel overlay (CPO) into strips. Then I hit it with a heat gun and a paint scraper until the old overlay was removed. This left a thick layer of 27 year old adhesive on the steel panel. I've tried nearly everything to get old adhesive off. The best I've found is regular Goo Gone. Spray it on, let it sit a few minutes, then scrape it off. 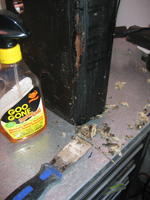 Usually this takes 2-3 applications to get all the old gunk off. It's not just adhesive, either, it's decades of whatever fell or rubbed off the people playing it. 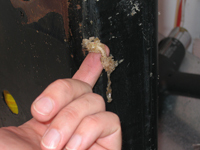 Can you tell what that gunk is in the picture? It ain't sunshine. The rust was sanded off and a new coat of gloss black enamel spray paint applied. 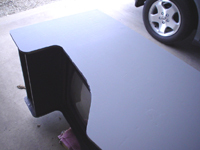 Even though the new overlay is a wraparound, painting it black first helps block further rust, and prevents the steel from showing around the outer edges and the trackball hole. The new overlay is also screenprinted, from very accurate reproduction art and purchased from Arcadeshop. I applied it in steps, similar to the sideart, smoothing it out as I went. The old buttons were still working fine, including the illuminated "cone" start buttons that are so hard to find these days. They just needed some cleaning up. The trackball, on the other hand, was a horror show. 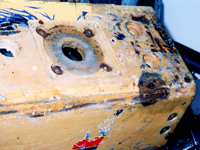 Can you guess what sort of stuff falls into the cracks around a trackball and piles up at the bottom of the housing? I don't honestly want to know, but here's a picture of it. The off-white trackball itself was from the ever-amazing Bob Roberts. If you ever need arcade parts, Bob is the first guy to see, no joke. 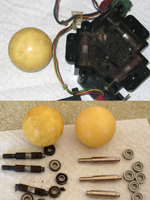 He also sells new rollers and bearings needed to get this trackball rebuilt and silky-smooth again. 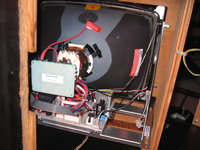 There was nothing wrong with the housing, encoders or wiring so that was it for the controls. Next was various odds and ends... 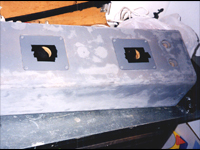 Installing the new 19" monitor, repainting the marquee brackets, installing a new marquee lighting balast and starter, repainting the coin door and replacing the rusted, broken leg levelers. I also used some royal blue poster board to trace and re-fold a new cardboard bezel that fits between the monitor and front glass. 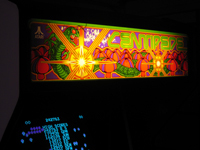 After some minor re-wiring (and vacuuming) inside the cabinet, Centipede was fully restored and ready to roll. 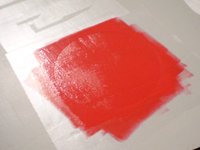 Here's another restoration diary, this time focused on re-stenciling sideart. 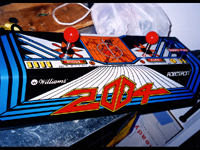 Once apon a time this was a Robotron: 2084. On top is a lovely green slapped on when it was converted to a crappy JAMMA game. 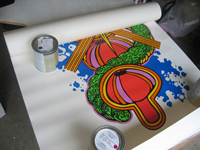 Under that is the Joust sideart, and under that is the original Robotron paint. Naturally, the first step is to strip it down to bare wood. 3M Safest Stripper works well for more sensitive jobs, but generally I prefer something faster and more toxic. 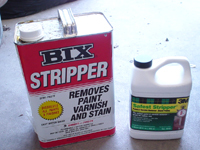 Any stripper in a tin can will work, but I usually go for Bix. I laid it on thick and let it sit in the open garage for a few hours. It really only takes a matter of minutes for this stuff to work, but I wanted it to go as deep as possible. After scraping it down with a wood-handled blade scraper, I was still left with at least a couple layers of paint. 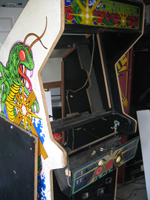 The green was gone, as was most of the Joust sideart, but most of the original Robotron paint was still there, as well as the primer layer. Another round of stripper and scraping, and it was nearly down to the bare wood. I washed it thoroughly with soap and water to remove any remaining stripper, and let it dry. Using Minwax High Performance Wood Filler, I patched a couple imperfections in the wood, then used a hand sander all over. 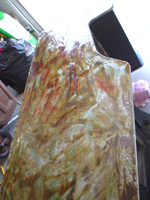 This removed some of the remaining paint bits, and smoothed out the surface. Using a good primer is pretty important. 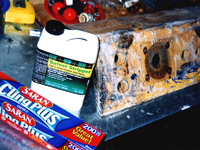 The key is using an "undercoater" primer. These have a higher percentage of solids, and hide small imperfections in the wood better than other primers. I put on two coats of primer with a small-nap foam roller, sanding between coats with finishing paper. The result was very smooth and uniform. After doing some research on the proper color codes, I was ready to paint. 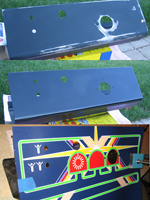 For the Robotron artwork, the next step was a couple coats of silver. Again, using a very fine, short foam roller. The key to getting good, mark-free coats with a roller is not putting it on too thick. If you're rolling over drips or gobs of paint, you've put too much on your roller. Two or three lighter coats, drying completely in between, will turn out very smooth. Once the silver base color was on, the real fun started (no really, I like doing this stuff). Since I didn't have a Robotron nearby to compare to, I had a friend send me some straight-on digital shots of the Robo sideart. From this it was fairly easy to recreate the art with vectors in Adobe Illustrator. I also doodled up a sheet with measurements from the edge of the cabinet, to ensure proper placement. After measuring out the extents of the art on the cabinet, I put down a layer of adhesive vinyl. I use rolls of "Clear Cover", which were about $5 each at my local Michaels. 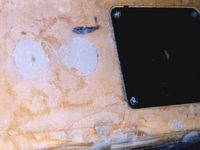 I'm sure there's many similar products, but the main advantages of this was 1) The adhesive was low-tack, and could be removed/repositioned without removing any paint under it, and 2) it was thin and cut easily. 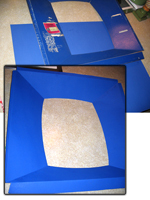 Once I'd covered the area with vinyl, I printed the art out at actual-size on several 8.5x11 sheets of paper. These were positioned (often overlapping) and taped on top of the vinyl. For the Robotron art, I did the red circle on top first, along with the blue bottom layer on the lower art. 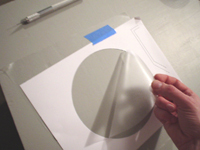 Following the lines on the printed sheets, I used an exacto knife to cut through both paper and vinyl. Freehanding the curves was easy, but I used a long steel ruler for the straight sections. If you try this, make sure you get extra exacto blades. They need to stay sharp so as not to snag the vinyl. I went through three blades per side for this project. 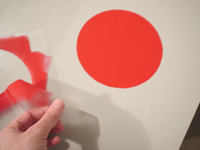 Then, pop out the holes you've cut in the vinyl and you're left with a perfect stencil to paint over. Since I don't have the facilities to do a full-on spray job, I again used very short nap foam rollers. Same technique used for the silver coat, put 2-3 coats on, each very light with full drying time in between. If you don't overdo it, the result is silky smooth and even. 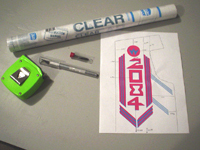 Once the bottom coats were complete and dry, I carefully peeled up the stencil vinyl. Perfect! No bleeding under the edges at all. Same procedure for the main red coat, and the blue Williams logo. Naturally, this required a new set of line printouts, and a new layer of vinyl. 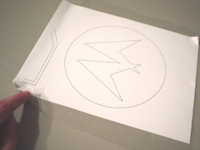 Trace with exacto, peel, and paint. As a final step, I like to use a topcoat of Varithane. This seals the artwork and makes it easy to clean, and gives it a bit more resistance to dings and nicks. I prefer the look of the water-borne satin finish rather than the oil-based Varithane. 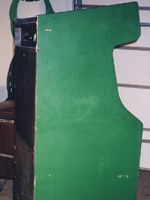 I restored this for use on a Robotron upright project. 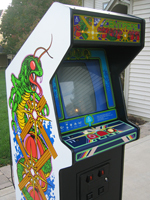 The cabinet came with a Joust CP, so I picked up this converted panel on eBay. It was in pretty sorry shape. 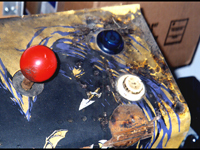 The Taito CP had tons of cig burns, stains, and was disintegrating in several places. On the other hand, the wood was still solid and it only had two extra holes. The existing controls were mostly junk (particularly the sticks) but I did save some of the leaf switch spacers. I started by removing all controls and hardware from the CP, and stripping off the old CP with a heat gun and putty knife. I've found this to be the easiest method of removing CPOs from wood panels. The trick is to use enough heat for the glue to soften, but not so much the overlay itself starts to bubble. If you melt the overlay, you'll get a sticky mess that's even harder to remove. After the old CPO was removed, I slapped on a coat of 3M Safest Stripper. After wrapping it in plastic wrap, it sat overnight. This only got off about half the glue, I'll probably use a stronger stripper next time. Using a putty knife and Goof Off, I scraped off the remaining adhesive. This is a lot of work, but it's important to get as much of the old adhesive off as you can. 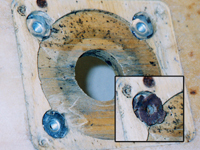 Depending on the age and thickness of the old adhesive, going over it with rough sandpaper can also be a timesaver, making the old glue ball-up and fall off. Once the old adhesive was removed, I installed new t-nuts on the joystick mounts. 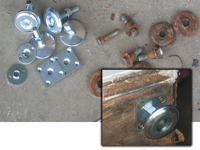 Two of the joystick screws had broken off in the old t-nuts, so knocking out the old nuts was really the only option. I also stripped, sanded, and repainted the steel joystick plates, using Krylon flat black. Now it was time to fill in the two extra holes in the CP. I stapled a small piece of waxed cardboard on the backside, covering both holes. Then from the front, I packed the holes with Minwax High Performance Wood Filler. This is a two-part wood filler that requires mixing, but I've found it to handle sanding better than the others I've tried. I overfilled the holes a bit, since I'd be sanding them down later. I also filled the smaller dings and nicks around the CP. 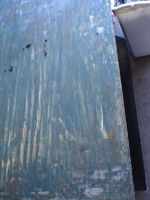 In the morning, I removed the cardboard plug from the underside and sanded down the excess wood filler. After sanding, I used a brush and damp cloth to remove any remaining sawdust. Now it was the time to reinstall the steel joystick plates, and add the plastic joystick disks. 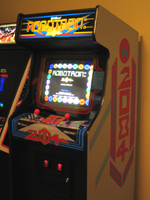 Many Robotron CPs have the disks on top of the CPO. Since I hadn't applied that yet, I was able to put them under the plates where they belong. I did a quick coat of Krylon spray primer after taping off the joystick disks. This isn't necessary by any means, but can arguably give the new CPO adhesive more bite. Some of the wood areas on my CP were so stained I felt like being safe. 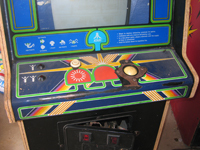 Finally, I applied the new repro CPO and installed the new Wico leaf sticks and buttons. I used a set of stainless steel joystick shafts that were the correct length for Robotron. It's amazing what new controls and art can do for a twenty year-old control panel. 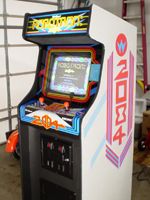 Add some more paint, new t-molding, wiring and glass bezel artwork and you have a fully-restored Robotron: 2084. Definitely a classic that's worth the effort.